Caution: Contains weird & wild Jelly Belly flavours. NEW 3rd Edition! 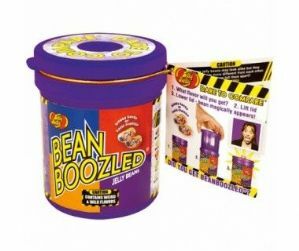 This NEW Pop Up 3rd edition Jelly Belly Bean Boozled contains 8 popular Jelly Belly flavours with 8 unappetizing jelly belly beans - unfortunately they look the same but taste soooo different - who will be the unlucky one this time! Ideal for party games adult and children alike. The flavours are very realistic - you have bean warned! buttered popcorn or rotten egg. Ingredients: sugar, glucose syrup, modified cornstarch, peach puree concentrate, natural and artificial flavourings, strawberry juice concentrate, colours: E100, E102, E110, E129, E132, E133, E150d, E171; salt, pear juice concentrate, acidity regulators E330, E331; chocolate (sugar, chocolate liquor, cocoa butter, E322, soy lethicin, vanillin), glazing agents: E901, E903, E904; coconut, cocoa powder, tapioca dextrin. may have adverse effects on activity and attention in children. 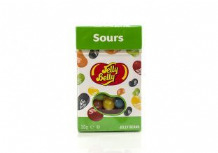 A collection of 10 flavours of Gourmet Jelly Belly Jelly Beans. A collection of fruitily sour Gourmet Jelly Belly Jelly Beans.